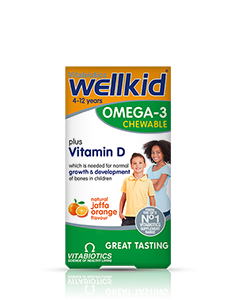 Wellkid Calcium Liquid provides a rich source of calcium and co-factors including magnesium and vitamin D, in a smooth, great tasting liquid that kids will love. 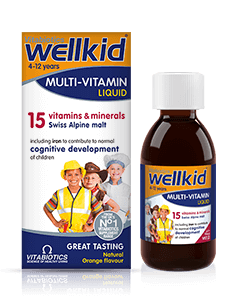 With a delicious orange taste, Wellkid Calcium Liquid is suitable for children aged 4-12 years, providing an easy way to help safeguard their vital intake of calcium. A measuring spoon is included in the pack. Evidence suggests that healthy practices early in life, including the adequate consumption of calcium and trace elements, contribute to normal bone health and optimal bone mineralisation. Peak bone mass, obtained during childhood and adolescent growth is known to be of major importance in maintaining bones later in life. 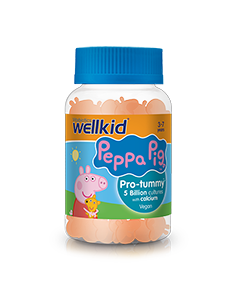 Wellkid Calcium Liquid carefully combines calcium with other mineral co-factors including zinc, magnesium and copper. 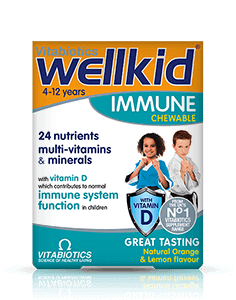 Wellkid Calcium Liquid does not contain any dairy products and is 100% fat free. It is ideal for those children using soya milk who may need to supplement their diet with calcium and magnesium. 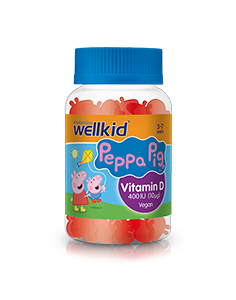 Wellkid Calcium Liquid is available in the UK from larger Boots, supermarkets, pharmacies and health stores. Click here to find an independent stockist near you. Alternatively you can order online here. Purified Water, Raw Cane Sugar, Stabiliser: Sorbitol, Calcium Carbonate, Magnesium Hydroxide, Thickeners: Microcrystalline Cellulose & Xanthan Gum, Natural Flavourings: Mint Oil & Orange Oil, Zinc Gluconate, Preservative: Potassium Sorbate, Emulsifier: Polysorbate 80, Copper Sulphate, Riboflavin Phosphate, Vitamin D3 (Cholecalciferol). 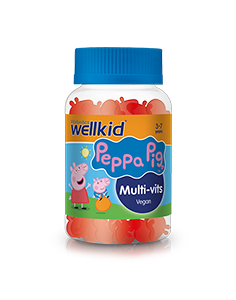 Children 4-6 years: 2 teaspoons (10ml) daily. Children 7-12 years: 3 teaspoons (15ml) daily. 1 teaspoon = approx. 5ml. Wash and dry the spoon thoroughly after use (not in a steam steriliser). Store in fridge after opening and use within 6 weeks. 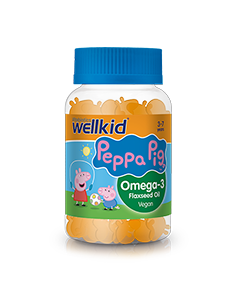 As with other food supplements, seek professional advice before using if your child is under medical supervision, have epilepsy, suffers from food allergies, or are allergic to any of the ingredients. Excessive consumption may produce laxative effects. Allergy Advice: For allergens, see ingredients in bold. Food supplements must not replace a varied and balanced diet and a healthy lifestyle. Keep tightly closed and store below 25°C in a dry place, out of sight and reach of children. 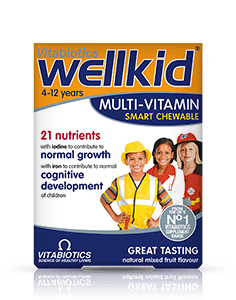 Why has Wellkid Calcium Liquid been developed? When is Wellkid Calcium Liquid recommended? 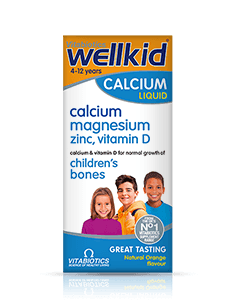 What do I need to know before starting to use Wellkid Calcium Liquid? Can Wellkid Calcium Liquid be used simultaneously with medications? How and when should Wellkid Calcium Liquid be used? 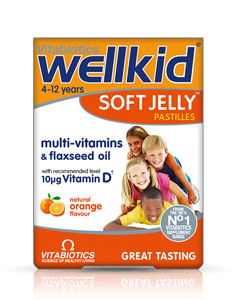 Are there any undesired effects whilst taking Wellkid Calcium Liquid? What is the source of calcium used in Wellkid Calcium Liquid? Always read the product directions before use. Do not exceed the recommended intake. As with other supplements, seek professional advice before using if you suffer from food allergies, If you have epilepsy or are taking oral anti-coagulants (blood thinners) consult your doctor or pharmacist before using this product. Vitamin supplements are not intended to treat or prevent any disease. Food supplements must not replace a balanced and varied diet, and a healthy lifestyle. Excessive consumption may produce laxative effects.